Dissolve yeast in the 1/2 cup warm water. Sprinkle with 1 teaspoon sugar and set aside to proof. In the bowl of a stand mixer fitted with a paddle attachment, cream sugar and butter. Add egg yolks and salt and mix well. Add the dissolved yeast, 1 cup of the flour and mix slowly with an electric mixer. Add the milk and continue adding as much of the remaining flour either with a spoon or with the mixer on low. Dough should be moderately soft and neither sticky nor too dry. You may use more flour, you may use less. Attach the dough hook and knead with the dough hook for about 5 minutes or until dough is smooth and elastic. Rub an empty mixing bowl with butter, put the dough in it, cover and let rise until doubled in bulk, about 1 to 1 1/2 hours. Punch dough down and turn out onto lightly floured surface. Pinch off egg size portions and roll into a ball using the palm of your hands in circular motion. Grease two or three rimmed baking sheets. Place the dough pieces about 1 inch apart and brush with melted butter. Spray a piece of plastic wrap with cooking spray, cover loosely and let rise for an hour. While rising, mix together ingredients for the Posypka Topping and the cream cheese filling. Make an indentation in each risen ball and fill with filling. Sprinkle with posypka topping and let rise again for 20 minutes. Bake in a preheated 425-degree oven for about 10-15 minutes. 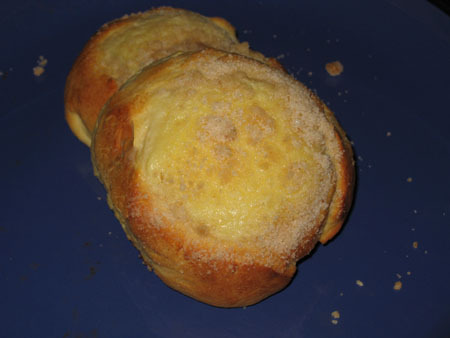 Brush kolaches with melted butter as they come out of the oven.